CNN is repeating its format from its previous GOP debate. Anderson Cooper, who was reportedly the debate moderator, will be joined by a panel of questioners made up of chief political correspondent Dana Bash and CNN en Espanol political anchor Juan Carlos Lopez. CNN Tonight anchor Don Lemon will also ask questions of the Democratic candidates submitted via Facebook. CNN is repeating its format, but not the participants. Gone are moderator Jake Tapper and questioner Hugh Hewitt (the latter a concession to Salem broadcasting, the conservative partner who apparently didn’t 100% trust CNN to treat the GOP fairly). As it turned out neither Hewitt nor Dana Bash had much to do in that talkathon. Tapper set the contentious tone that pervaded the three-hour-plus event. Nobody seems to be questioning the reason for jettisoning most of the team from the GOP debate, but maybe it was more about who they wanted to replace them with. 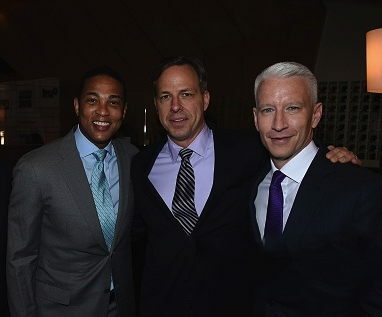 Both Cooper and Don Lemon are openly gay, and not shy about offering “analysis” on issues relevant to that constituency—which just happens to be a key Democratic voting block. Mr. Lopez is an unexpected addition (there wasn’t any fourth questioner with the Repubs). Lopez is particularly attuned to matters involving immigrants—which just happens to be another interest group important to Democrats. But The Cable Gamer is probably overthinking this. This could all be simple coincidence. After all, why not fire the team that delivered CNN its highest ratings in history? Meanwhile, what could Jake Tapper be thinking? After succeeding wildly with the game plan to provoke fights among the GOP participants and provide CNN producers with a plethora of two-shots, Tapper will find himself watching the sequel from the sidelines. Will Cooper be a provocateur like Jake was, needling and prodding the participants to go at each other? The Cable Gamer has to think if CNN wanted Tapper-type questioning they would get Tapper, not yank him off the stage. Now it’s silver-haired Anderson Cooper’s show, and however it turns out, it won’t be the same without Jake.